This winter was a “longie” with lots of snow, a situation which voles love. In our market garden we discovered damage from voles on Campanula medium (Canterbury bells) – just the ones stored in pots in sawdust, but not those in the ground. Also some potted Primulas, strawberries, and Echinaceas were completely eaten. It was the same case with these last few; plants in the ground were unharmed, those in pots in sawdust were eaten. It may be because plants all stored together serve a sort of “banquet” for voles, while those in the ground, mixed in with other plants are harder for the little critters to find. I am experimenting with inter-planting Fritillaria imperialis (Crown Imperials) with plants that tend to be vole favorites, to see if they will help deter them. Fritillarias are very odorous, and rodents do not eat them. Finish pruning and grafting of fruit trees if not already done. Plant grapes and other fruiting perennials, shrubs and vines; fertilize and prune raspberries and blackberries. Start many flowers inside for transplanting out and direct sow the last hardy annuals. Direct sow many vegetables late in the month and into May. April is characterized by ups and downs in temperature – watch for frosts. Protect frames at night and admit air daily. Place row covers on newly transplanted, slightly tender plants. Direct sow these outdoors once weather permits and soil temperatures are above 45 degrees: beets, arugula, carrots, caraway, celery, chervil, chives, cilantro, dill, fennel, thyme, oregano, sorrel, collards, mache, fava beans, cress, Jerusalem artichokes, kale, kohlrabi, cabbage, cauliflower, leeks, lettuce, mustard greens, rhubarb, turnip greens, onions, parsley, parsnips, peas, potatoes, radishes, salsify, scallions, spinach, Swiss chard. Sow corn after the 20th. Direct sow outdoors all month: annual alyssum Lobularia maritima, Bupleurum, carnations, pinks, sweet Williams, Cynoglossum, stocks, rose campion, wall flowers, Lychnis, lupines, lavateras, columbines, valerian, polyanthus, auriculas, Canterbury bells, hollyhocks, honeysuckles, rockets, honesty, fox gloves, snapdragons, sweet peas, poppies, larkspur, cornflowers, nigella, Lavatera, poppies, valerian, kiss-me-by-the-garden-gate, dill, morning glory, sweet peas and wildflowers. Shade auricula primroses from intensifying spring sun. 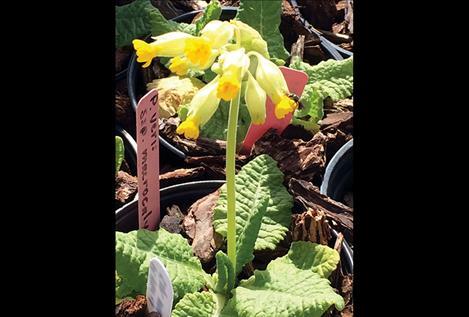 This is when auriculas need the most water, but remember – never waterlog the compost. The month of April is their peak bloom period and hybridizing can take place now. Shows are held this time of year. Finish transplanting roses and other shrubs (the earlier the better). Prune established roses after severe frosts. Cut out all dead and crossed wood, and seal the cuts with water-based glue to prevent the drilling wasps from destroying canes. Dress rose plants with Epsom salts, wood ashes, compost, manure, alfalfa meal, bone meal, kelp meal, bunt earth, spent hops, etc., but keep fertilizers two inches away from the canes at the base of the plant. ants in the ground were unharmed, those in pots in sawdust were eaten. It may be because plants all stored together serve a sort of “banquet” for voles, while those in the ground, mixed in with other plants are harder for the little critters to find. I am experimenting with inter-planting Fritillaria imperialis (Crown Imperials) with plants that tend to be vole favorites, to see if they will help deter them. Fritillarias are very odorous, and rodents do not eat them. Weed fruit trees, strawberries, cane fruits. Set out apple pest traps two weeks before bud break.